The National Museum of Australia shares the stories of all Australians. Our vision for reconciliation is that we will work closely with communities to create opportunities for Aboriginal and Torres Strait Islander peoples to contribute to, and participate in, the Museum’s programs. Through everything we do, our vision is to show respect to Aboriginal and Torres Strait Islander peoples, to value their culture and histories and to be inclusive and welcoming to all. Sculptor Sid Bruce Shortjoe from Pormpuraaw Arts and Cultural Centre, Cape York, runs a NAIDOC Week workshop in the Museum. 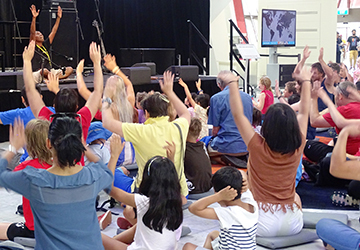 Bangarra dancer and Torres Strait Islander Elma Kris leads a workshop in the Museum's Hall. The National Museum of Australia was established by the National Museum of Australia Act 1980 to collect, document, research and communicate the history of Australia. The Museum is a social history museum. We explore the land, nation and people of Australia. We focus on Aboriginal and Torres Strait Islander histories and cultures, histories of European settlement and our interaction with the environment. The Museum currently employs 242 staff. We currently have 10 Aboriginal and Torres Strait Islander people on staff. We have a national focus with displays and exhibitions held on our Acton site in Canberra. Additionally, we develop and tour travelling exhibitions to national and regional centres across Australia and internationally. Our Reconciliation Action Plan (RAP) has been developed utilising the talents, enthusiasm, experience and skills of people across the organisation. Development of the draft RAP began under the stewardship of an executive leader with input from a workshop involving staff from across the Museum. The first draft was circulated to those involved in the workshop, our Aboriginal and Torres Strait Islander support network MINmin, and senior management. A draft was presented to our Indigenous Reference Group that provided feedback and it was then circulated to Reconciliation Australia for comments and feedback. The Museum’s Diversity Working Group reviewed the draft before circulating to executive members, all senior managers for discussion with their staff, MINmin members and those involved in the initial workshop. A final draft was recirculated to the Museum’s Indigenous Reference Group and Council for approval. Bundjalung weaver Kylie Caldwell (right) from Richmond River in New South Wales with her daughter, Kyeoma. Kylie has run workshops at the Museum and was one of the inaugural winners of the Encounters Indigenous Cultural Workers Scholarships. enhance and foster improved relationships with Aboriginal and Torres Strait Islander communities across the nation. The Museum’s RAP is championed by the Director and senior executive members of the organisation. Our RAP Working Group has representation from across the three divisions of the Museum and includes Aboriginal and Torres Strait Islander people and non-Indigenous people. A RAP Working Group is formed and operational to support the development, launch and implementation of our RAP, comprising Aboriginal and Torres Strait Islander peoples and other Australians. A member of the local Aboriginal and Torres Strait Islander community is invited as well as other stakeholder groups to participate on the RAP Working Group. RAP Working Group meets a minimum of four times a year. The current RAP covers the financial year 2015–16. The RAP Working Group will develop the next RAP in the first half of 2016. The Museum’s Executive and Council endorse the appointment of the Director as RAP Champion. Other Reconciliation Champions or Ambassadors for the RAP are nominated. The Museum advocates for a continued presence of a minimum of one Aboriginal or Torres Strait Islander person on the Museum’s Council. Museum holds a special event to launch the RAP. A recent acquisition by Aboriginal and Torres Strait Islander artist is used as part of the design and delivery of the final RAP document. All three Australian flags are flown across all sites. The Museum will assess progress against measurable targets at the end of 12 months. Establish a staff award to recognise staff who make a significant contribution to the implementation of the RAP. Host one internal staff event for National Reconciliation Week. 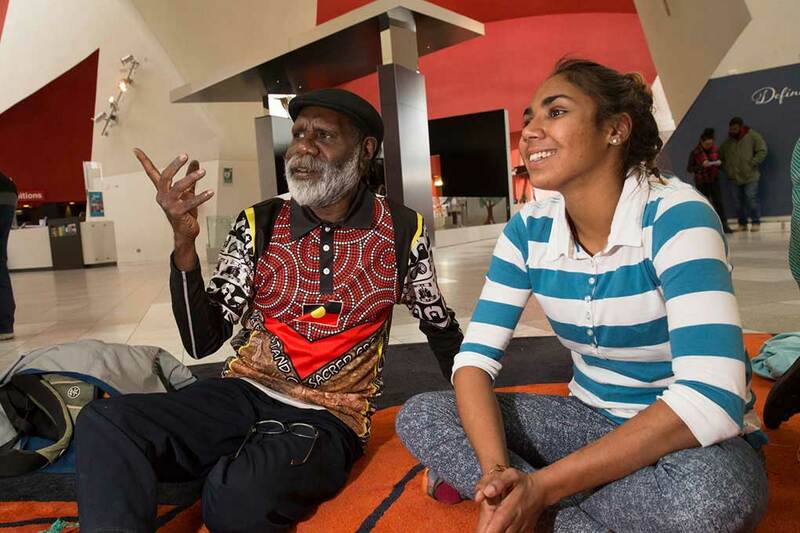 The Museum identifies opportunities each year to engage with the historic moments connected with National Reconciliation Week (eg the 1967 Referendum and Mabo decision) and to reach out to broader Australia through social media and other channels. RAP Working Group will have at least six Museum business units (two from each division) represented and will include Aboriginal and Torres Strait Islander representation and non-Indigenous representation. Include RAP as part of induction for new starters. Develop a RAP page on the intranet, on the Museum website, and report on RAP activities in annual report. Develop and implement a plan to raise awareness across the organisation about NMA’s RAP commitment, including publishing the RAP. A presentation on Museum’s RAP commitment is provided at an all staff meeting to ensure staff have an understanding of how their area can contribute to the RAP. Continue and expand the MINmin and MINmin Lite partnership. Maintain an active Indigenous Reference Group, with national representation. The IRG has the opportunity to contribute to strategic planning. Museum staff members have opportunities to engage with the IRG. The IRG meets a minimum of twice a year. Provide support and advice to MINmin members to assist their work across the Museum. Support MINmin members to organise community events. Promote these programs through Museum publications (print and online) in addition to mainstream and Aboriginal and Torres Strait Islander media outlets. Acknowledge and promote significant anniversaries or events through social media and online. Identify key events that will be supported. Ensure that these are well advertised and supported across the Museum. Explore mechanisms whereby the Museum can measure and report on participation of Aboriginal and Torres Strait Islander people in Museum programs. Explore mechanisms whereby the Museum can measure and report on general audience participation in Aboriginal and Torres Strait Islander events. The Museum hosts two community events organised by MINmin and the RAP Working Group, to provide opportunities for access and engagement between the Museum and the local and regional Aboriginal and Torres Strait Islander communities. Strengthen ongoing community relationships by hosting events and providing a free meeting place for local Aboriginal and Torres Strait Islander community groups, facilitated by MINmin. Provide in-kind support to community-based organisations by providing venue hire discounts. Goree magazine is launched online, and provides a conduit for information in and out of the Museum. A feedback mechanism is developed and communicated. Increase and consolidate the Museum’s social media presence. Record and report on the number of followers and hits to the website. Investigate new relationships with organisations in Canberra that engage with Aboriginal and Torres Strait Islander culture, such as the Australian National Botanic Gardens, local heritage organisations etc. Compile a list of all current external partnerships and map connections to internal business areas. Evaluate Aboriginal and Torres Strait Islander projects such as Encounters and how the learnings from projects can be incorporated into other business areas. Continue partnership with Elevate RAP Partner AIATSIS and develop opportunities for collaboration through the Memorandum of Understanding. Explore partnerships with higher education institutions including formalising the relationship with ANU and hosting a series of community-based forums. Continue to build a relationship with international organisations and museums to facilitate access to Aboriginal and Torres Strait Islander cultural artefacts held in overseas collections. Encourage Council members to explore opportunities for partnerships with NMA within their organisations RAPs. Scope opportunities for collaboration with other organisations to promote cultural awareness eg DFAT graduates annually. Continue to look for opportunities to invest in and extend outreach through new interactive technologies and applications to engage stakeholders, eg robot, Goree online, in support of increasing Museum’s social media presence. Ensure external content features references and connections to Aboriginal and Torres Strait Islander peoples, histories and cultures. Focus area 4 Ensure that the National Museum of Australia reflects our national identity. Deliver a range of exhibitions, products and programs using Aboriginal and Torres Strait Islander collections and other content. Gallery of First Australians Stage 1 redevelopment commences. Prepare scoped plan for complete re-development of Gallery of First Australians within life of current Strategic Plan. Advertise Gallery of First Australians permanent gallery more broadly, and examine opportunities for cross promotion. Encounters project advertised and Aboriginal and Torres Strait Islander community participation recorded. Promote Narragunnawali: reconciliation in schools and early learning program to school groups that attend Museum sessions. Indigenous Australian Art Charter of Principles for Publicly Funded Collecting Institutions. At least one staff seminar annually on Aboriginal and Torres Strait Islander responsibilities and protocols. Finalise and implement the Museum’s Indigenous cultural rights and engagement policy and principles. Ensure that all staff are briefed on the requirements for community consultation, and have the skills and information they need to facilitate meaningful consultation processes. Staff informed at all staff meetings, via intranet and at senior managers meetings. Brief front of house staff including visitor services, education, public programs and other relevant staff regarding changes in exhibitions, displays and programs. New Aboriginal and Torres Strait Islander Program content announced on Museum website, RAP page and on Goree email network. Aboriginal and Torres Strait Islander staff to be briefed on new content and developments by Aboriginal and Torres Strait Islander Program staff. Recommend staff attend at least one presentation on Aboriginal and Torres Strait Islander history and culture. Host a NAIDOC Week public program event. Business unit managers support Aboriginal and Torres Strait Islander staff to attend NAIDOC events. Host a NAIDOC Week event with the aim of maximising attendance by Museum staff. Provide Acknowledgement of Country information for use by organisations hiring the Museum’s venues. Recommend an Acknowledgement of Country at the entry of the Museum or in a prominent location. Consider adding Acknowledgement of Country to Museum recruitment information. Ensure that cultural protocols are incorporated into business as usual. Raise staff awareness of the purpose and use of protocols, through provision of information on intranet and at all staff meetings. Continue to facilitate Aboriginal and Torres Strait Islander culture, history and exhibitions internationally. Progress made on delivery of one major exhibition of Aboriginal and Torres Strait Islander culture to an overseas cultural institution. Provide training opportunities for cultural competency and professional development programs for all staff, and ensure that all staff are informed about relevant training or development opportunities. Investigate how to embed participation and completion of cultural awareness training into individual performance agreements. Investigate co-mentoring options for other Australians by Aboriginal and Torres Strait Islander staff. Display a warning graphic on exhibitions for Aboriginal and Torres Strait Islander peoples (deceased persons). Ensure editorial guidelines for referencing of Aboriginal and Torres Strait Islander peoples in Museum content are followed. Encourage all of Museum’s stakeholders to develop and share a RAP by including the document in service-provider briefing documents and information sessions. Identify opportunities for work experience for Aboriginal and Torres Strait Islander students. Consider options for secondments between Museum staff and Aboriginal and Torres Strait Islander organisations. Look at unique opportunities for Museum jobs in order to attract Aboriginal and Torres Strait Islander applicants. 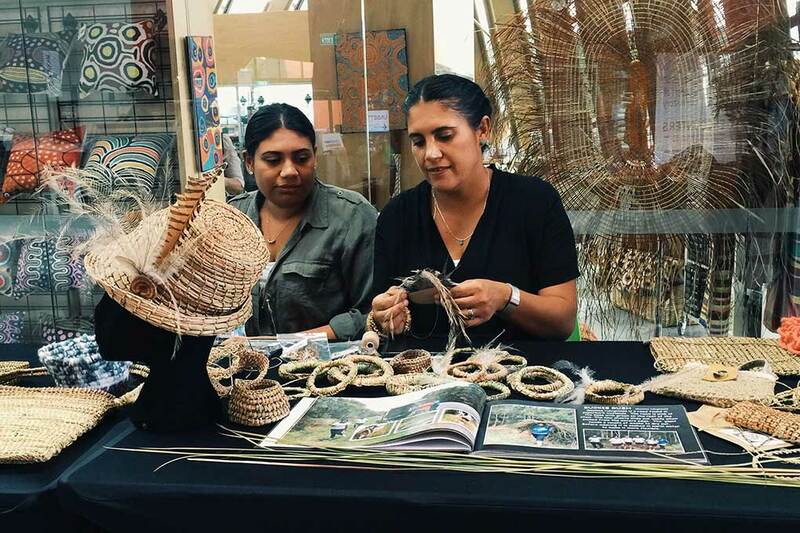 Review current procurement practices and how the Museum stocks its shop through purchasing from an Aboriginal or Torres Strait Islander business. Investigate membership with Supply Nation. Merchandising through ICIP, inclusive of Aboriginal & Torres Strait Islander business lines. Invite local Aboriginal and Torres Strait Islander suppliers and contractors to participate in market days ‘Selling Yarns’, MINMin’s Aboriginal and Torres Strait Islander food days etc. Formalise and increase partnerships with artists and stock suppliers and promote artists’ and makers’ works through the Museum’s retail spaces. Review current procurement processes to expand Aboriginal and Torres Strait Islander procurement. Promote Museum events and exhibitions to the tourist market. Annual reporting on implementation and outcomes of the RAP to be presented to the Council and Indigenous Reference Group. RAP progress is to be reported in the RAP Impact Measurement Questionnaire in the Museum’s annual report. RAP Report available on Museum’s website, RAP page and Reconciliation Australia website.